For much of 2016, South Africa has been hard hit by Â drought, with food prices rising and water restrictions being put into place throughout the country. We spoke to rooftop farmers and gardeners about how their urban initiatives can help with food security and the drought. Firstly, whatâ€™s a rooftop garden? Rooftop gardens are all about using unused spaces to set up a farm or a garden. 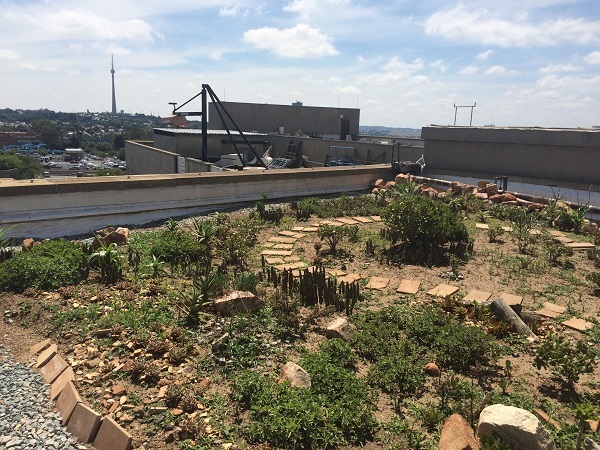 â€œAbout 30% of the surface in Johannesburg is roof area, so if you could utilise a good half of the roof spaces that you need, youâ€™ve got a 15% area that you can add onto your food farming. So then you can start creating a lot more urban food supply,â€ said Givarn Singh, a environmental engineering masters student at the University of the Witwatersrand. Singhâ€™s research looks at how to design buildings sustainably, with a focus on the benefits of rooftop gardens in Johannesburg. Jozi Food Farmer’s Braamfontein rooftop garden. Here, they grow a variety of things including mint, rocket, lettuce and basil. Why should we have rooftop gardens? 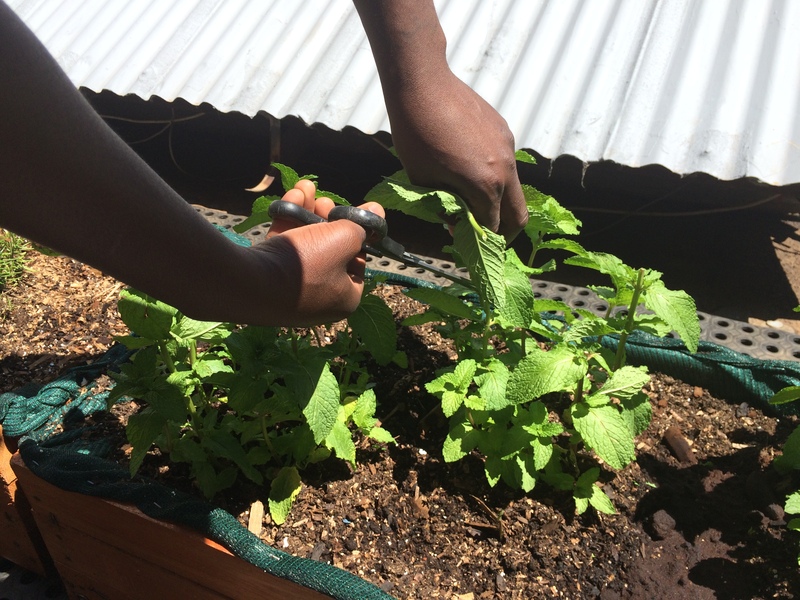 There are many benefits to having rooftop food gardens in Joburg. Ashleigh Machete is the co-founder of Jozi Food Farmer, a company that focuses on the urban cultivation of unused spaces such as rooftops, alleyways and open areas. They also provide a service to private homeowners and businesses, such as restaurants, to set up and maintain their own food gardens. Machete says that rooftop gardens can help to increase the value of city spaces. â€œIn Joburg, pollution is everywhere and having a bit of nature around itâ€™s good, because there are nice [beneficial] insects. The benefit is that we are making fresh food available to the public and we are also beautifying the environment – weâ€™re increasing the value [of the land],â€ said Machete. Singh explained the benefits of roof gardens in a city like Johannesburg. Cities like Johannesburg have many impervious surfaces such as tar and concrete pavements. When it rains, they prevent the rainwater from going into the ground and it ends up causing flash floods, like we saw a few weeks ago, said Singh. â€œWhatâ€™s awesome about a green roof is that now you have soil on your impervious surfaces. So any rain incident on the roof, a portion of it will be collected on the roof and it will be stored in the soil,â€ he said. So the more water that’s collected in the soil, the less runoff there will be on the tar roads and pavements. Rooftop gardens also bring some beauty and nature back into the city. â€œEssentially weâ€™ve removed that little portion of nature and then built something concrete on top of it. By us putting a green roof there, weâ€™re pretty much replacing what weâ€™ve removed,â€ said Singh. So more birds, bees and butterflies for us! A rooftop garden that Givarn Singh is maintaining on top of the Hillman building for civil and environmental engineering. So can rooftop gardens help with food insecurity? Building more rooftop farms can help provide those who live in cities with much-needed nutrients. â€œItâ€™s not that we want to give you 100% food supply, but we want to complement someoneâ€™s diet with nutritious valuable food, spinach, tomatoes, pumpkin and vegetables. Thatâ€™s the drive,â€ said Singh. Machete manages some gardens for the Johannesburg Housing Company in areas such as Hillbrow and Fordsburg. He explained that people inside those buildings would be able to buy produce from the gardens. So instead of relying solely on farms from outside the city, people would now be able to access fresh vegetables from inside the city. 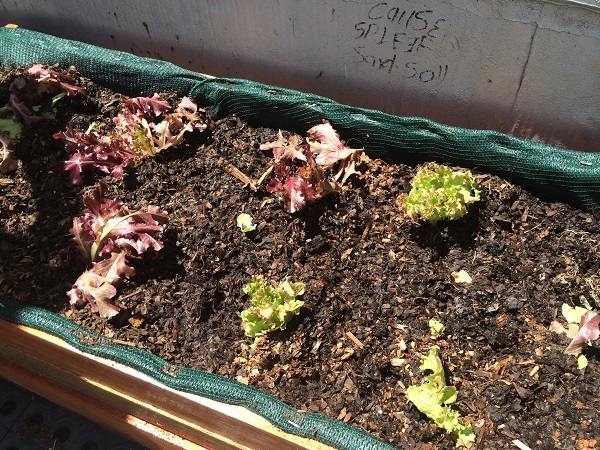 Lettuce grown from Jozi Food Farmer’s Braamfontein rooftop garden on the corner of 70 Juta. How hasÂ the drought affected rooftop farmers? Even though weâ€™re in the middle of a drought, Machete says that they havenâ€™t been too badly affected by it. â€œI think in Joburg, with the drought, we donâ€™t get affected that much because we use other things like grey water and recycled water,â€ he said. 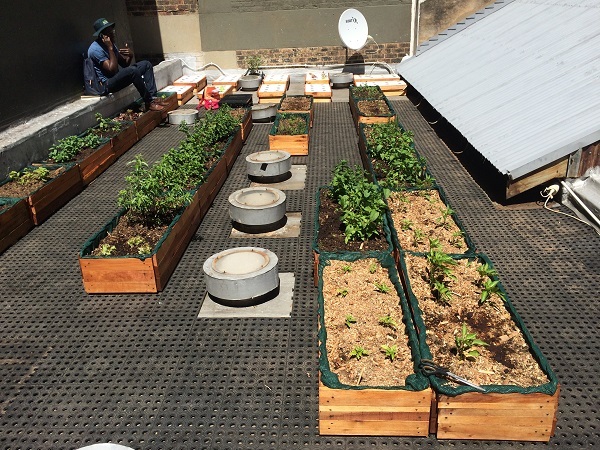 Jozi Food FarmerÂ encourages tenants to keep the water used in cooking vegetables, which they can then bring to the rooftop gardens and receive a discount on produce. They also collect organic waste from tenants, which goes into enriching the gardens. Rainwater is also collected in JoJo tanks which are installed at most of the gardens, and together these measures have enabled the gardens to survive the drought. There’s also an emphasis on planting “water-wise” and indigenous plants so that they do not use too much water. 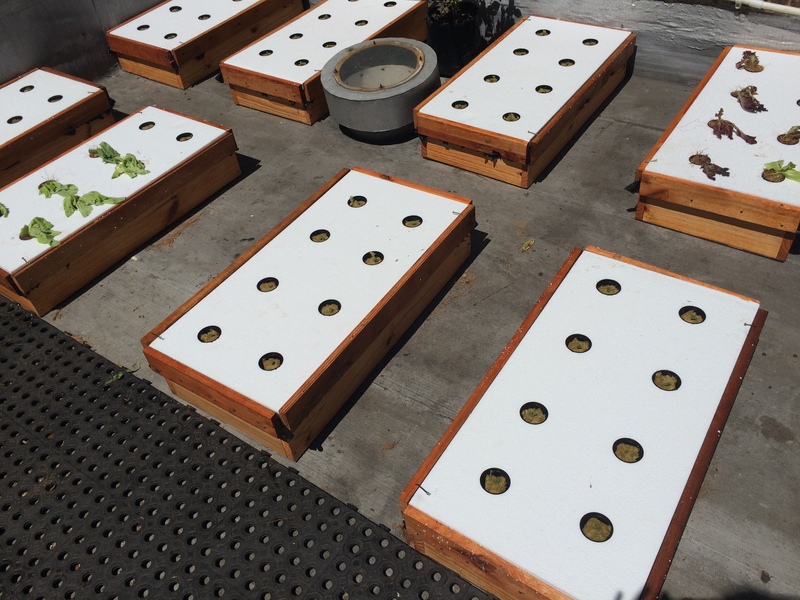 A simple hydroponic system set up by Jozi Food Farmer is a type of system that you can set up without having to frequently maintain it. How difficult is it to set up a rooftop garden? Setting up the garden, while challenging, isnâ€™t the most difficult part of this process. Itâ€™s actually getting access to the space and continuously maintaining it. â€œThe City of Johannesburg owns a lot of buildings that are not being used, spaces that are dumping sites, and accessing those spaces is a big challenge for us,â€ said Machete. He meets with the municipality regularly to try and get access to these rooftop spaces. For Singh, one of the biggest challenges is finding someone who is committed to drive the project. â€œItâ€™s not regulated well enough by government, itâ€™s not regulated well enough by industry for it to really sustain or ensure that there is a good follow up of people that are really passionate about seeing it through in the long term,â€ he said. 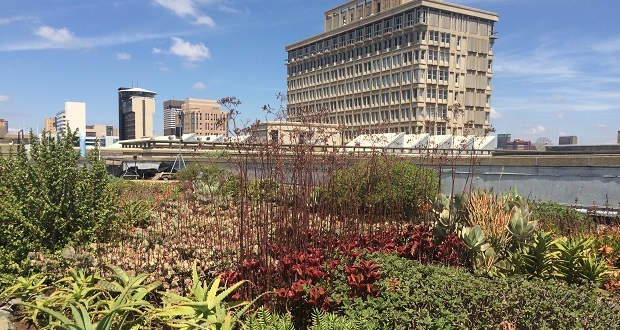 There are many benefits to having more rooftop gardens in a city like Johannesburg, especially during drought season. Itâ€™s not even that challenging if you want to grow your own. â€œAnyone can grow, people mustn’t be discouraged about starting their own backyard garden or a rooftop farm. Itâ€™s very simple, it just needs you to start,â€ said Machete. If youâ€™re looking to get started, check out this guide. Ashleigh Machete cutting some mint from the Braamfontein rooftop garden. Editor’s note: On request from Ashleigh Machete, the reference to usage of grey water has been removed, and replaced with a more accurate explanation of recycling water. Dana Da Silva is an intern at the Daily Vox. Her interests include politics, gender and all things geek. When she's not interning she enjoys roleplaying games like Dungeons and Dragons, cosplay and live action roleplaying (larping).